we swear, it’s not as hard as it sounds. This is a shout out to all collectors, decorators, and art enthusiasts who are intimidated by the thought of commissioning a painting, but thrilled at the prospect of working with an artist on a piece of their very own. Perhaps you’re in search of a particular size, color combination, or price point, but can never seem to find exactly what you want. Whatever the reason, commissioning art is a great way to immerse yourself in the creative process and **spoiler alert** it’s not as scary as it sounds. Many artists LOVE doing commissions as they can work with a specific client and enjoy the challenge of translating your vision into a work that speaks to their practice. The first step to commissioning a painting is to choose an artist based on your style and budget. Depending on your exposure to the contemporary art market, you may already have a short list of artists to consider. If not, websites such as artsy.net or artnews.com are useful tools to allow you to search for artists based on an array of categories such as subject, color, and even price. Not all artists do commissions, so you may want to contact a few to suss out their interest. Find an artist who is excited about your brief and the prospect of working with you: good artist-client chemistry in the early stages predicts a more fruitful commission. Prepare a short, but detailed brief that describes your commission. This can be as simple as stating the color palette, size, and budget of the work you’re looking to make, but can also reference particular paintings that you like by the artists in consideration for the commission. In most cases, you can send your brief directly to an artist via their website or gallery. The latter will serve as a representative and mediator during the process and may also negotiate the terms for the commission. A gallery or artist’s agent will add its fee into the overall price, so keep that in mind with regards to your budget. Once you choose a specific artist, set up a time to meet—it’s best if this happens at their studio, but a video or phone chat is also okay. Be prepared to expand upon your brief by showing any additional references that illustrate how you want the painting to look or feel. Inspirational materials such as personal photographs and color swatches are all great references when discussing the style and personality of a commission. It’s also helpful to have interior photographs or plans of the area where the painting will hang as the artist can then visualize the overall environment. At the initial meeting, you should also discuss the timeframe and logistics of the commission. What schedule are you hoping to achieve? Will packing, delivery, and installation be included? These are all topics of negotiation. You may wish to see progress of the work in various stages to make sure it’s following your idea. If so, talk about this early on so that the artist can work it into the overall schedule. Progress reports can be as simple as receiving photographs of the work as it evolves or even visiting the studio to see the development in person. Negotiate a timeline that adequately accounts for fabrication, packing, delivery, and installation. Use this meeting to also confirm the budget and payment terms. For a painting, it’s reasonable for an artist to request enough money upfront to cover the materials and any design work, such as sketches or other mockups. This is usually in the form of a 25% to 50% deposit, which varies depending on the overall cost of the commission. In some instances, a written agreement is requested by the artist or gallery rep to solidify the details. The most exciting part of a commission is the grand finale—the installation! If the artist is local, they often prefer to personally deliver and install the artwork to ensure that it’s hung correctly as well as to see how it suits the final space. Whether it’s with the artist, art handler, or your trusty hammer and nail (picture hook, please), don’t rush the installation. Take care to use the proper hardware and… For the love of everything… Pay attention to the hanging height! Designers often subscribe to the rule of the 57” artwork height (measured from floor to middle of the wall). We suggest using this as a starting point, then adjusting depending on the conditions of your room. Do you have high ceilings? Will the painting hang above furniture? 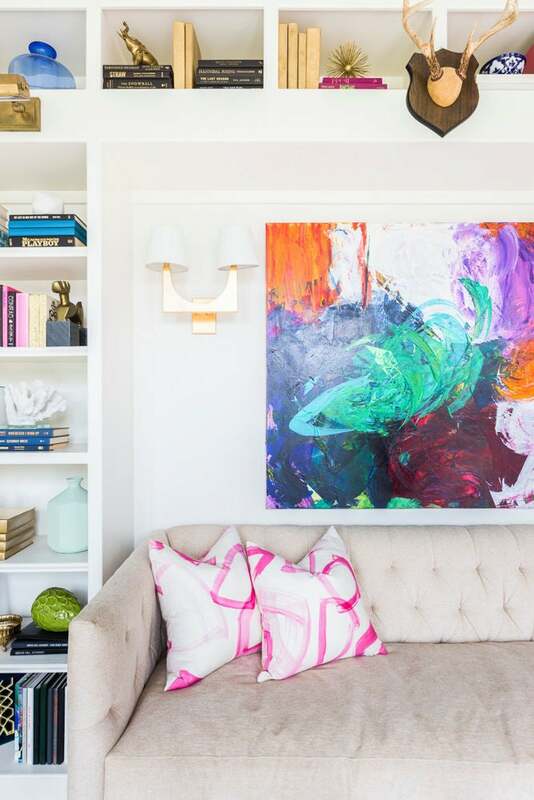 These factors may require you to adjust the height, so that the artwork looks best suited for the space. Starting with the 57” artwork height gives you a guideline. Use blue painter’s tape to mark a height of 57” from floor to the middle of the wall. Then use additional tape to mark out the overall length and width of your painting. This can be done by designating the corners of the piece, so that you can start to see its full scale on the wall. Once you feel comfortable with the height, finish the installation and use a level to make sure the painting is hanging straight and evenly against the wall. Finally, stand back and enjoy!